With the creation of the new Srirausage, it is only right that we give praise to the delicious not so secret ingredient that gives the Srirausage such bold taste. It might be hard to spell, but this sauce packs heat and flavour like no other, dubbing it one of the world’s “coolest hot sauces.” Oxymoron? I think so, but Sriracha is too cool to care! So here’s a history lesson on one of the most successful and coveted hot sauces in the world. Grab your Srirausage, a frosty craft beer and let the story begin…. The origin of Sriracha has been debated for years, but the Huy Fong Foods Sriracha that we know and love comes from our American neighbours and is produced in Rosemead, California. Creator and CEO David Tran never dreamed of riches or building a multi-million dollar company, he just wanted some damn good hot sauce. Tran arrived in the States from Vietnam in the 1980’s and began to suffer from hot sauce withdrawals. He realized that the sauces here weren’t as spicy or as fresh as they were in Vietnam, so he took matters into his own hands and created a Thai sauce mixture using hybrid jalapeno peppers, sugar, salt, garlic and vinegar; the ingredients haven’t changed in 33 years. After spending years perfecting his process, he began to distribute the sauce and it became a worldwide hit. Most hot sauces that are produced today use dried chilies to lower costs and increase production, but Tran being the uber cool CEO that he is, believes in quality over quantity. Sriracha always uses fresh chili’s, which gives the equates to the unique flavour and sets them apart from the competition. Tran even stated that his goal isn’t to make money, but “to make enough fresh chili sauce so that everyone who wants Huy Fong Foods can have it. Nothing more.” You don’t get much more humble than that! Sriracha sales have sky-rocked in the past decade, with sales reaching over 20 million bottles and double digit growth every year. And the best part is Tran and his company do NO advertising, we do it all for him! 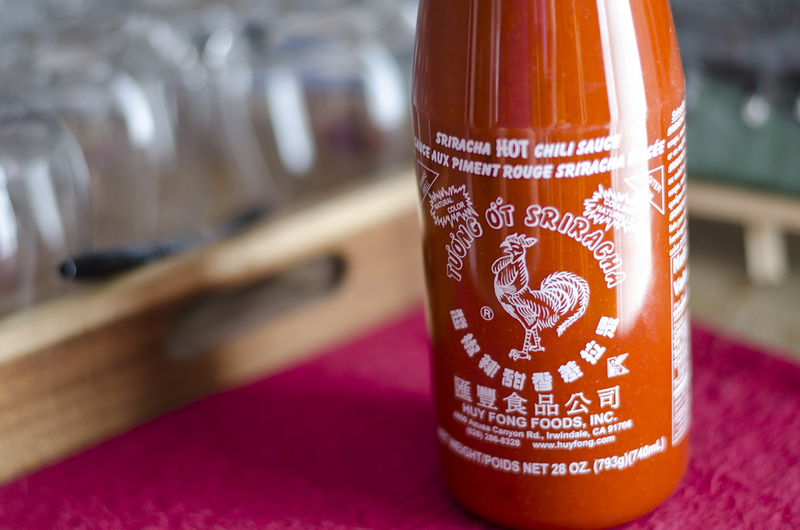 Sriracha has not only become a delicious staple in the fridge, but a trendy brand that everyone wants a piece of. Although Tran sees the hype, he and his company stay pretty conspicuous, avoiding social media and basing their sales off people loving and sharing Sriracha like we are. And the love just keeps on coming. So when you’re biting into that juicy Srirausage and you taste the delectable Sriracha flavour, you can tell your friends the story of Mr Tran, and his journey to bring spicy joy and happiness to all you hot sauce lovers out there. Srirausages can be purchased at Robbie’s Gourmet Sausage Co.